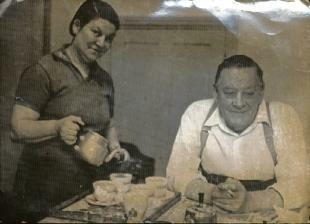 About Ted Hill, who lived in Clifton Terrace, Wivenhoe, made a life peer for services to trade unions. Died 1969. The following article was written by Tom Parkes and published in the Colchester Gazette on 29th June 2009. He was the left-wing activist who became a lord and was accused of being a revolutionary red. And now claims about the life of Ted Hill have resurfaced to support his critics’ claims. Lord Hill of Wivenhoe only took the title two years before his death, in 1969, and rather than a grand manor, his Wivenhoe seat was a humble cottage in Clifton Terrace. During his 18 years as general secretary of the Boilermakers’ Union and 16 years as president, however, the man nicknamed Terrible Ted was a household name, not only in Wivenhoe but across the country. A lifelong campaigner for workers’ rights, he was one of the organisers of the 1934 national hunger march and congress, along with Aneurin Bevan, the miner’s son who became the chief architect of the NHS. Representing shipbuilders as well as boilermakers, he once held the power to empty every shipyard in Britain – and was not afraid to use it. He became the target of hate-mail during the 1957 engineering strike, when he famously declared he didn’t care if productivity was boosted unless workers benefited as a result. The critics branded him the Boilermakers’ Blockbuster and a communist. The claims were denied by his widow, but according to the testimony of Soviet defector Josef Frolik, Lord Hill was a KGB informer and his handler was Colonel Nicolai Berdenikov. The story originally came to light in the 1970s, when Czech agent Frolik published his memoirs. The names of several union officials were cut from the text on legal advice, but taking advantage of Parliamentary privilege, Tory MP Stephen Hastings told the Commons, in 1977, that Hill had been among those named and had been visited at home by Berdenikov. His widow, Hannah, then 70, dismissed suggestions of KGB connections as “tommy rot”. However, the allegation linking Wivenhoe to cold war conspiracy has refused to go away. Frolik passed the names omitted from his book to Josef Josten, head of the Free Czech Information Service, on condition they should not be revealed until all the alleged informants had died. The last to go was Jack Jones, who died a few weeks ago aged 96. He was popularised as Britain’s most powerful man due to his huge influence as general secretary of the Transport and General Workers’ Union. University of London researcher Douglas Eden claims Josten passed the list to him and he has gone public with the claim that Jones, Hill and several others were heavily involved with a London-based Soviet spy circle. Eden says Frolik saw Hill as a promising target as he was a member of the Communist Party of Great Britain. But when he sought permission to recruit him, he was told Berdenikov had already taken him on board. There is evidence however that the former Wivenhoe Urban Council chairman was frequently feted as an honoured guest on visits to the Soviet Union. When he died, Lady Hill arrived for the funeral at Colchester Crematorium in a car with a huge laurel wreath on the bonnet, a gift from Soviet trade unionists with interwoven red carnations and tulips. The full facts may never be known unless old KGB files or British secret service intelligence is made public. Until then, the suggestion that one of Britain’s most powerful union leaders was in the pay of the Kremlin may prove as elusive as one of Hill’s famously-teasing answers to journalists at press conferences. Asked if he was a heavy drinker, he once replied: “I drink brandy because it suits my heart. If they shared the atheist attitude of true communists, a reunion in heaven will have taken Mr Jones and Lord Hill by surprise. Should they meet up, though, they will no doubt renew old acquaintances over a glass of gin and Italian – or will it be a bottle of Russian vodka? Note: This article was first Published by the Colchester Gazette on 29 Jun 2009. The article was researched and written by Tom Parkes. Reproduced here by kind permission of the Editor, Colchester Gazette. Permission given 21 April 2016. Known as ‘a man of the people’, Lord Hill had a long career with the Society, from the age of fourteen when he entered the Boilermakers Society in Plaistow as an apprentice riveter. He became a full-time official of the Society in 1932, as a London District delegate after having held office as Branch President and being a member of the London District Committee. He also served as a member of various committees and councils looking out for the interests of boilermakers, shipwrights and blacksmiths. To this end, he authored a pamphlet “Coffin Ships” in 1935, which highlighted the practice of ship owners sending out un-seaworthy ships. During his tenure as General Secretary of the TUC from 1948 until his retirement in 1965, he realised his dreams of an amalgamated Society of Boilermakers, Shipwrights, and Blacksmiths; and a forty-hour week in the shipbuilding industry. In 1967, he received a Life Peerage, becoming Lord Hill of Wivenhoe. The collection of personal and administrative correspondence and ephemera was donated to the Albert Sloman Library at the University of Essex in 1970 by Lady Hill. This page was added on 22/04/2016.